It didn’t start great when we arrived in Tao Yuan International Airport around midnight of the same day. The car service that we booked to fetch us didn’t show up. We were all tired and it was almost 3 in the morning so we didn’t have the energy to get mad or stressed. Instead, we took a taxi straight to our hotel in Ximending which is in Taipei – around an hour drive away from the airport. I, for one, enjoyed the car ride to Taipei. It was great to see what it would look like if everyone’s asleep and there are less cars on the road. I was already impressed with their road signs and traffic lights. I mean, it actually works there, you guys! Skyways are everywhere. Some of which are way, way up that it would be higher than some buildings. It even got to the point where we couldn’t see anything past the headlights because of thick fog. Talk about horror scenarios. A bit scary, but I was more amused since we don’t experience that a lot here in Cebu. We finally arrived in our hotel, 1100 NTD poorer, we settled down, and 3 hours sleep we had. With sleepy zombie brains, we made our way to the nearest MRT station and figured out how to get an Easy Card. It is the equivalent of London’s Oyster Card or Singapore’s EZ-Link. It is quite easy to find these machines as they are in most MRT stations, usually lined up against the walls. No problems with language barrier so far since labels are in English: Easy Card Sale & Add Value. They even have machines for coins to bills exchange and vice versa that you can use for free! Tap the touchscreen and select English. Instructions are clear so you need not to worry. The card is worth 100 NTD with zero balance by default. Once you get the Easy Card, you need to top up before using it via the same machine. If you’re a tourist, you may get a refund after you’re done using the Easy Card. To do that, just approach the Information booth that you can find in any MRT stations. You’ll get the amount that’s left on your card plus the card’s worth (100 NTD) minus a service charge (20 NTD). You may use Easy Card in all MRT stations and most buses around Taipei including those going in and out of the city. We also used the Easy Card for entry to Maokong Gondola. So it’s definitely worth to get one. This line has access to Taipei Zoo and Maokong Gondola. This line has access to Beitou Hot Springs, Yangmingshan Park, National Palace Museum, Shilin Night Market, Taipei 101, 228 Peace Memorial Park, Taipei Expo Park and Taipei Main Station. This line has access to Raohe Nigh Market, Ximending Night Market, Chiang Kai0Shek Memorial Hall, National Taiwan University. This is the only line we didn’t get to use. This line has access to lots of night markets, though, should you want more options. We have been on this line the most since we stayed in Ximen. It has easy access to all other lines, thus, platform change often happens here. 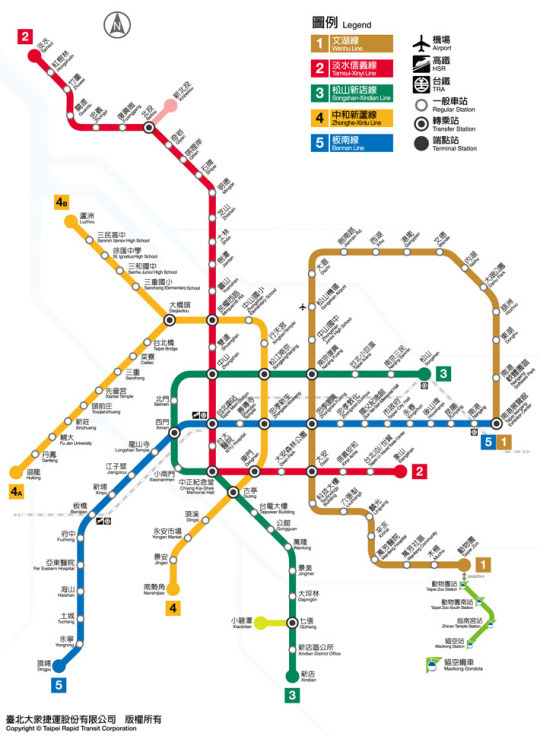 This line has access to Ximending Night Market and Taipei Main Station. Taipei MRT is a no brainer. As long as you know the concept of MRTs, you are good to go. To elaborate, each line has end points, you need to know this for you to decide which direction you are going. You also need to know if there are platform changes required. (5) you alight at the Taipei Zoo Station. (2) you alight at Ximen. End points are important for train direction. Stations with two intersecting lines are important for platform change. You tap from the station you are in and tap again on the station where you alight last. Buses and bus stops are trickier as they don’t usually offer English signs. You have to know basic Chinese. Or else, prepare to compare Chinese characters from your Google map search to the bus guides. There are bus numbers but that’s about the closest we can get to English characters. They also have audio systems, much like trains, so you can hear the stations announced, but that’s it. I can’t explain much on this but to warn you, prepare your maps, the exact bus number and the stations involved. Also, there is no consistent rule on how to pay fare on buses. Usually, it would be to tap when you get on and tap again when you alight. There were instances, though, that we didn’t have to tap during start of travel. There were also instances when we had to tap directly after getting on the bus and not when alighting. So listen to the driver, or the friendly grandmas, they’ll probably start talking to you in Chinese quite aggressively (and lovingly at the same time?). That’s your cue. So are we ready for the great beyond that is navigating around Taiwan? NO! But we’ll try, haha! See you in Yehliu Geological Park!